The college is committed to reducing our greenhouse gas emissions. The college first set an emissions goal in 2007, and we were well on track to reach that goal – 10% below 1990 levels by 2020. Because of this, and strong pressure from the college community, in September 2015, President Falk and the Trustees committed to further address climate change. Through action on campus and in the immediate community, reduce emissions to 35% below 1990 levels by 2020. 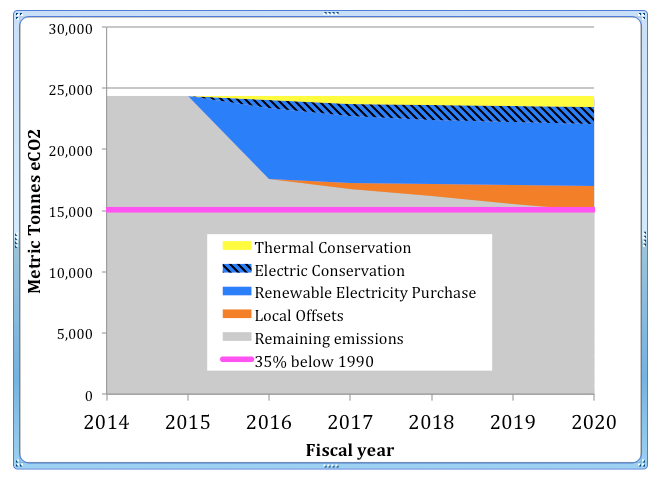 Purchase sufficient carbon offsets to achieve carbon neutrality by the end of 2020. There are only two real ways of reducing emissions: reduce energy use, and use energy from renewable, non-emitting sources. Williams is pursuing both strategies. Williams’ emissions come largely from heating, cooling, lighting and ventilating our campus buildings. The College has been investing actively in energy conservation and efficiency in campus buildings since 2007, and will continue to do so – about $1,000,000 every year. That money will be focused going forward on improving building envelopes – air sealing, insulating, weatherizing, and replacing windows. That sort of work is disruptive, so the pace at which it can be done is limited by the logistics of the campus. The other significant contributor to Williams’ emissions is travel – primarily air travel. The Zilkha Center is organizing an ad-hoc working group that will be exploring ways to reduce the environmental impact (more broadly than just emissions) of travel (to and around campus) and parking on campus. The group will consider recommendations from a parking study done in 2009, as well as any new recommendations. Williams is committed to producing and/or procuring 100% renewable, non-emitting electricity by 2020, which will contribute significantly to reaching our emissions goals. We will continue to install solar photovoltaic panels on campus. Plans currently include Horn Hall on Stetson Court, Hollander and Schapiro Halls, the new science facilities, the new bookstore on Spring Street, and possibly canopies over several parking lots. Rooftop solar will likely never account for more than 10-15% of annual campus electricity use. The Zilkha Center and the VP for Finance and Administration’s office are investigating large-scale renewable electricity procurement off-campus. One possible approach is to collaborate with some number of peer institutions to procure a larger amount of renewable electricity (and thereby support larger new renewable electricity generation than any one of the institutions could alone). Williams may also be interested in investing in renewable electricity projects as part of its commitment to impact investing – that possibility will be actively investigated over the next year. Read the Spring 2018 update about the collaborative approach for a solar facility that will be online by 2020. In addition to reducing greenhouse gas emissions on campus, Williams is investigating the possibility of investing in similar projects in the local community. We will continue to pursue projects on campus, but at some point it may well make more sense to fund lower-cost and higher-yield projects off campus than increasingly expensive projects on campus as we work our way through our portfolio of projects. We have hired CET, an environmental non-profit based in Pittsfield and Northampton to assess the feasibility of such an approach. We’ve asked them to focus on weatherization, energy conservation, and renewable energy projects that benefit local low-income residents, non-profits, and educational institutions. Our hope is to have multiple positive impacts – reducing emissions while also reducing energy costs for people and organizations under financial stress. Our hope is to have a pilot project underway by the end of the current academic year to test the real cost and feasibility of such an approach. In conjunction with actively working to reduce emissions, the College has committed to not increasing emissions through new construction. Each building project going forward is required to not increase emissions – for renovation or renovation/addition projects, the final building(s) must not use more energy or cause more emissions than the currently existing building(s). For completely new square footage, the building must be net-zero emissions. Video created by Zilkha Center intern Jamal Meneide ’19 during the summer of 2018.